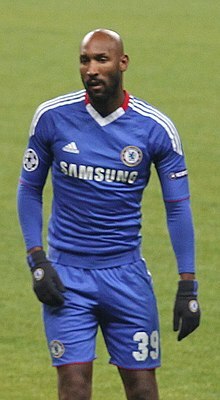 After two-and-a-half years, Anelka returned to the Premier League in December 2001 to join Liverpool on a short-term loan deal until the end of the season. He contributed to Liverpool's late push to come second in the 2001–02 FA Premier League, scoring goals against Everton,Fulham, Blackburn Rovers, Ipswich Town, and in the 2001–02 FA Cup against Birmingham City, but manager Gérard Houllier opted not to offer him a permanent deal after the end of the season in favour of signing Senegalese forward El Hadji Diouf. ^ Includes Trophée des champions, UEFA Super Cup, Community Shield (1998, 2009, 2010), Supercopa de España, FIFA Club World Cup (2000), Süper Kupa, Chinese Super Cup and Supercoppa Italiana. Wikimedia Commons has media related to Nicolas Anelka.